In his first release since the best-selling There is More to the Secret, Ed Gungor challenges the church to return to authenticity and community. ^Over and over again in scripture Christians are encouraged to "make vows to the Lord" (e.g., Psalm 76: 11). Is it possible that making vows-- intentionally inserting various Christian practices into our lives-- would have great value to 21st-century Christians? What if we thoughtfully and publicly articulated vows before God and those we love? Would it help our lives take on the tone of the eternal? Has something been lost in the openness of the 21st century? 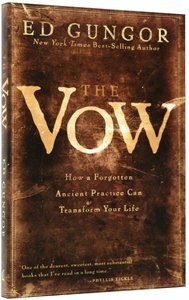 The answer is yes ^ Gungor says: "Vow-making is an old trail that was very familiar to the ancients who have gone before us, but is virtually unknown for we moderns. As I have wandered down this path, it has been both intriguing and empowering, and, on another level, just plain dangerous. But I really think it's leading somewhere. That's the why of this writing." Ed Gungor serves as senior pastor of Peoples Church in Tulsa, Oklahoma. He is a popular and dynamic speaker, challenging people at churches, universities, and conferences to make a positive and faith-filled impact on their world. Gungor is also the author of several books, including the New York Times best seller There Is More to the Secret, Religiously Transmitted Diseases, and the soon-to-be-released The Vow.